Has it ever happened with you that you’re driving or walking past a colony and you see a big hoarding above the colony main entrance gate? Yes we’ve all noticed these big hoardings and banners advertising big famous brands in a unique way. But we’ve never actually thought that it is pretty popular evolving form of marketing in India known as RWA Branding. The next question that comes to the mind is that what’s the point of advertising your products through banner or hoarding posted on a colony entrance gate? The answer is pretty simple and straight forward. Any business would die to have a larger visibility in comparison to its competitors. RWA Branding comes at a cheaper yet unique way of marketing its products which ensures a large visibility. RWA branding comes across as a cheaper source of marketing than the highly expensive display hoardings yet giving almost the same results as them. They not only cater to the people living in a particular colony but also the people passing by on the roads. The main strategy is to encourage the customer for impulse buying therefore ensuring higher sales and ultimately higher profits for the business. So what’s in for the RWA’s? We all are aware that in todays time , because of the increasing crime rates and rising concern about cleanliness and hygiene, RWA’s needs more funds in order to ensure all these facilities are made available to the residents. The members contributions are nowadays not sufficient to bear all these safety and cleanliness expenses so RWA branding comes as a saving grace in this scenario. It provides the RWA with the much needed funds which they can use for ensuing proper safety, clean roads and parks and other maintenance activities. Going for RWA branding is a win-win situation for both the companies and the RWA. For one it gets the much important viewership whereas for the other it is a source of much needed revenue. 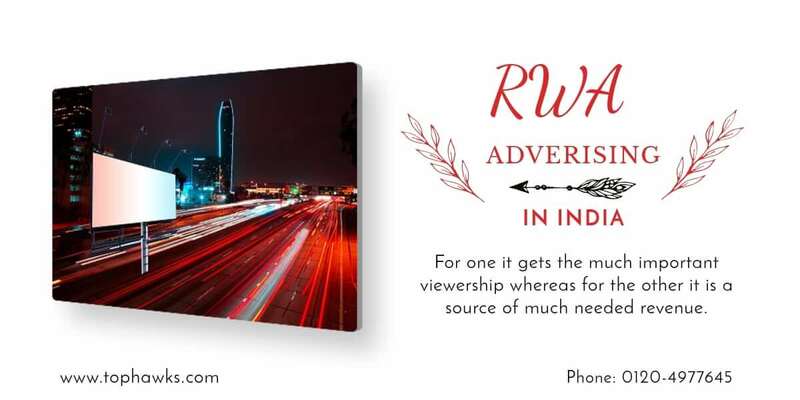 So next time whenever you go past a colony and notice a hoarding, now you’ll be totally aware that its RWA branding, an effort made to increase the brand visibility.